Description: Effective treatment of adult acne & blemishes. Less drying - without Benzoyl Peroxide. Clears up acne pimples. Helps prevent new acne pimples from forming. Formulated without Benzoyl Peroxide. 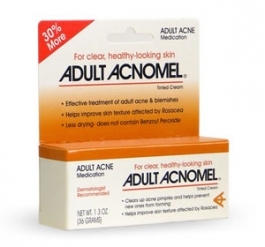 Acnomel Acne Medication Cream is especially suitable for adult skin, which is less oily. It is less drying than products containing Benzoyl Peroxide and more gentle to the skin. Good for teenagers too.Directions: Cleanse the skin thoroughly before applying medication. Cover the entire affected area with a thin layer one to three times daily. Because excessive drying of the skin may occur, start with one application daily, then gradually increase to two or three times daily if needed or as directed by a physician. If bothersome dryness or peeling occurs, reduce application to once a day or every other day. Store at controlled room temperature (59-86 degrees F).Ingredients: Active Ingredients: Resorcinol (2%), Sulfur (8%). Inactive Ingredients: Alcohol (15% W/W), Bentonite, Fragrance, Iron Oxides, Potassium Hydroxide, Propylene Glycol, Titanium Dioxide, Purified Water.Warnings: For external use only. Apply to affected areas only. Do not use on broken skin or apply to large areas of the body. Do not get into eyes. If excessive skin irritation develops or increases, discontinue use and consult a physician. Using other topical acne medications at the same time or immediately following use of this product may increase dryness or irritation of the skin. If this occurs, only one medication should be used unless directed by a physician. Keep this and all medication out of the reach of children. In case of accidental ingestion, seek professional assistance or contact a Poison Control Center immediately.